WOT (Web of Trust) is an online service that allows you to see how trustworthy are the sites that you are visiting on daily basis. With the help several million users who are continuously building WOT database, you can be assured that whenever your browsing lead you, you will always know how secure you are. WOT works as an add-on to your browser, always notifying you about the safety level on the sites you are visiting. Additionally, it integrates with the most popular search engines such as Google, Yahoo!, or Bing and links on social networks (Facebook, Twitter, Wikipedia), immediately showing you green, yellow or red icon beside search results or links. 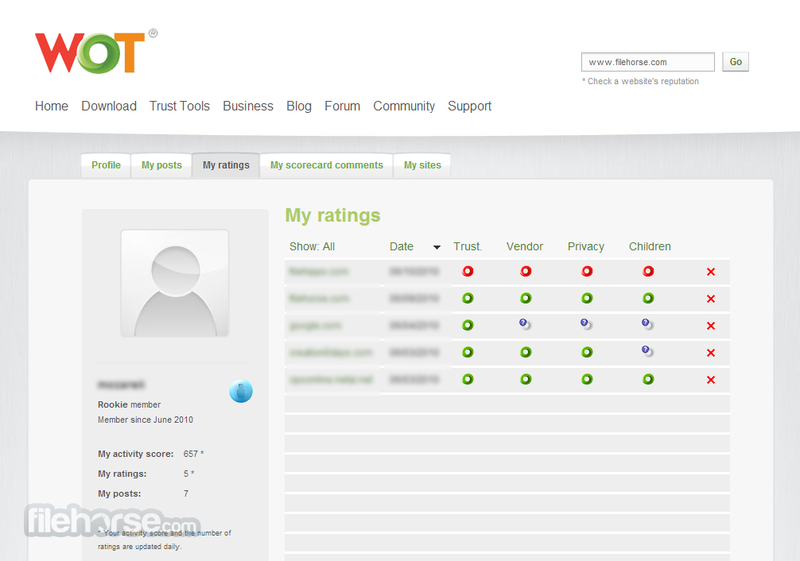 That way, you can easily identify untrusted sites and never even visit them. With over 48 million times downloaded and millions of active users who are contributing in database creation , Web of Trust add-on for your browser represent one of the most easiest ways to protect yourself from dangerous sites, scams, sites with unsuitable content and places that collect personal information without your consent. If you land on a site that has poor reputation based on user ratings, WOT shows you a warning. WOT guides you, but the final decision is yours: you can skip the warning and enter the site, or return to the previous page. Reputation icons are also shown next to links on search engine results, social media platforms, webmail, and other popular sites to help you search safely. Adjust icon visibility from the add-on's settings. When the WOT add-on is installed, you will see a small doughnut shaped icon next to your browser's address bar. 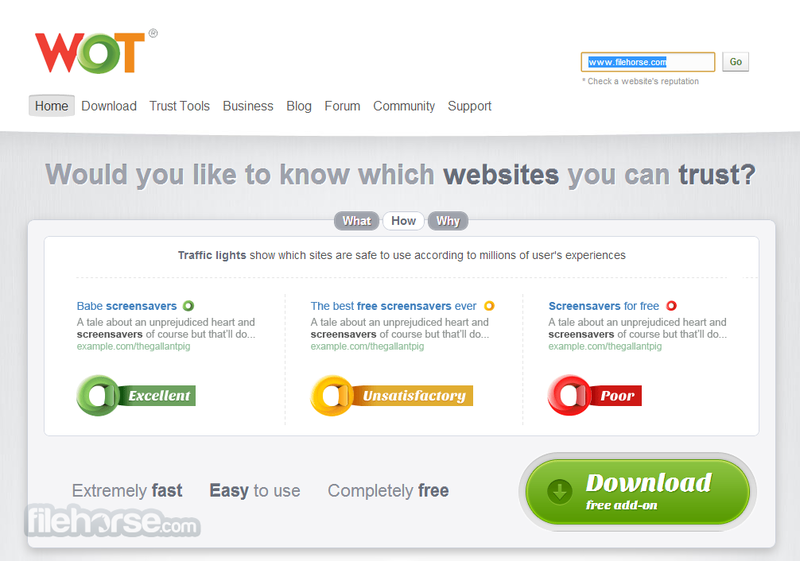 The icon shows you the site's rating and reputation: green indicates a safe website, yellow tells you to be cautious, and red indicates potential danger. 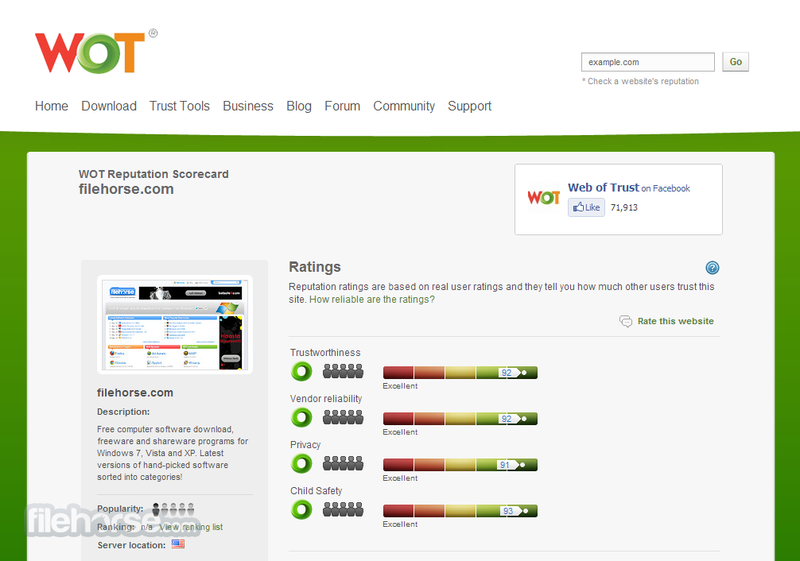 Use WOT's add-on and mobile app to check for site safety based on community ratings and reviews. Secure a simple and safe browsing experience. Our add-on doesn’t slow your browser, it’s easy to use and free.